Of the mountain towns and quaint hamlets and rustic villages I’ve visited in the Adirondacks, I think I like tony Lake Placid the best of all. In the winter, Lake Placid bustles with vacationers drawn to the area for skiing and other cold-weather activities. It’s hard to believe this small, out-of-the-way village hosted the Winter Olympics – twice! Once in 1932, and most recently in 1980, when the U.S. ice hockey team beat the Soviets in “The Miracle on Ice.” You can visit the famous rink today, and other relics of the village’s Olympic glory are scattered throughout the streets and ski slopes. 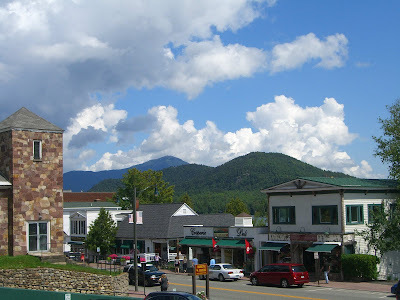 In summer, Lake Placid turns into a resort community where scenic views and a plethora of outdoor adventures are well complemented by shops, galleries, and a number of diverse dining options. 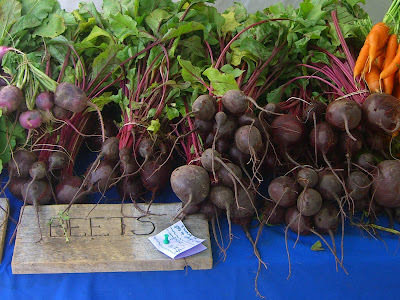 On a recent Wednesday morning, I visited Lake Placid specifically to check out the Adirondacks’ premier farmers’ market. 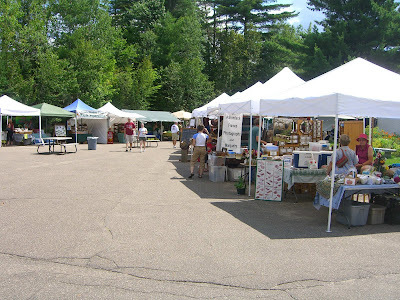 The Lake Placid Farmers’ Market is located at the Lake Placid Center for the Arts. 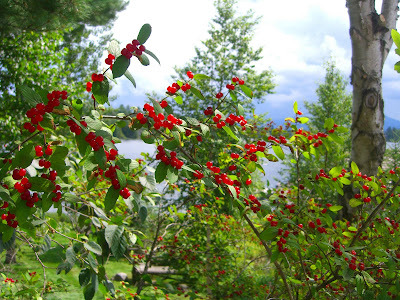 Apart from having the pleasure of browsing through the Center’s gallery, which was showing a collection of portraits from a Vermont photographer at the time of my visit, guests to the market can also enjoy the beautiful seasonal garden. 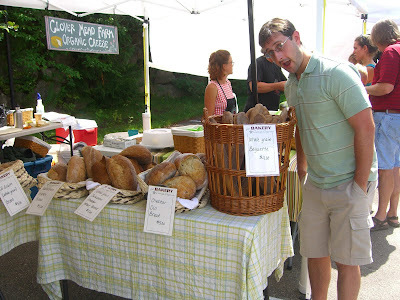 We were so excited by the local veggies, breads, prepared foods, local meats, flowers, syrups, and cheeses, and we stocked up on organic hummus, breads, heirloom tomatoes, herbed farmers’ cheeses, spicy lettuces and pea shoots, pattypan squashes, monster spring onions, and a variety of herbs. After enjoying picturesque vistas over Mirror Lake, and stopping to appreciate the many colors of the season… We headed back to camp for a simple dinner using our farmers’ market bounty. 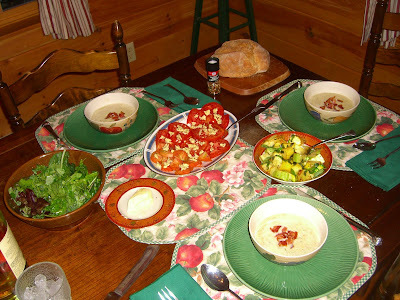 Juicy heirloom tomatoes with fresh herbed cheese, sautéed pattypan and two-toned summer squash with basil, spicy lettuces and pea shoots dressed with olive oil and lemon, and watercress bread… … and the star of the meal, creamy sweet summer corn chowder. 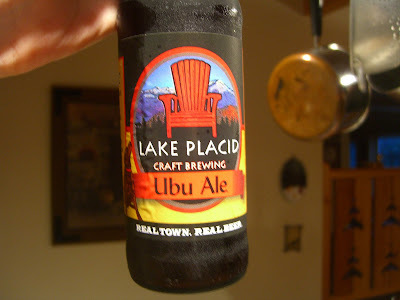 (Recipe below) It was all washed down with a Lake Placid Ubu Ale, a dark brown American strong ale with a surprisingly high ABV of 7%. 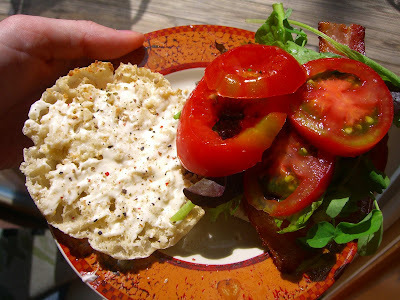 We continued to enjoy our farmers’ market abundance throughout the week, with BLTs nearly ever afternoon. It is imperative that this recipe be made with the sweetest corn at the height of summer. In a large, heavy-bottomed pot or dutch oven, sauté bacon until fat is rendered and bacon is crisp. Remove bacon with a slotted spoon to a plate lined with a paper towel. Add the white parts of the spring onions or leeks along with the red pepper flakes to the bacon drippings, and sauté until translucent but not brown. Add the garlic and stir for a minute, just until fragrant, then dump the corn kernels and the green parts of the leeks into the pot. Sauté, stirring every once in awhile, for 5 minutes. Pour in the chicken stock and simmer for 20 minutes. Carefully puree the soup in batches in a blender or food processor and return soup to pot. Add 2 tbsp cream and heat just until warmed. 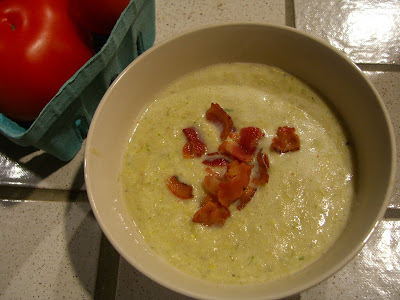 Ladle soup into warm bowls, drizzling remaining cream over top and garnishing with reserved bacon and a basil leaf. Love it, Cari! Your Photography is very good and the recipe suggestion sounds yummy. Best of all I think I can make that recipe, no problem! 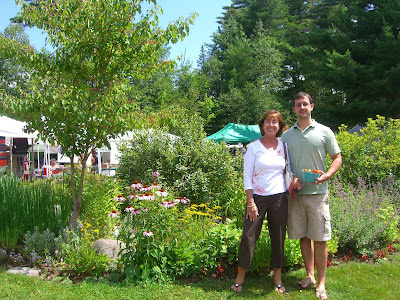 ML and I have not been to Lake Placid in several years. We went white water rafting, fishing, and shop hopping. The boys played some golf there too. It's high time we made a return visit. Thanks for taking us there. 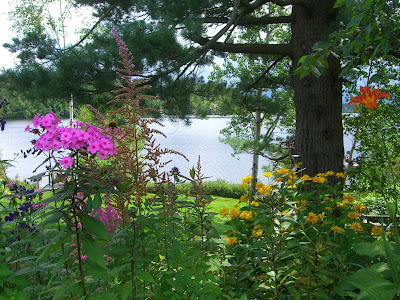 it all looks lovely and so nice to see their lake home too! i'd be as big as a house if i ate everything you write about. it makes me want to feast, reading this. darn it! Philip, I just got a sweet new camera so hope the photography gets even better in the near future! I love Lake Placid - you should def try and return soon. Jeannie - yes, isn't their lake house amazing?! We really look forward to going up there once a year or so... and it was great to escape this oppressive Florida heat for a week.